I thought before the summer that this would be the summer's biggest drama premiere. Now I'm not so sure, especially since The Whispers surprised me with a 1.5. Zoo's timeslot doesn't seem good; its NCIS repeat lead-in may not crack a 1.0, and it has to face both America's Got Talent and possibly the tail end of a USA match in the Women's World Cup. Reviews are pretty blah, and it doesn't really seem to have the buzz I would've expected. The good news is that though it doesn't have a Halle Berry-sized star, this one seems stronger conceptually than something like Extant, which was derailed by very confused promotion. 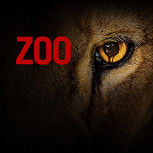 Zoo seems like it might have a Jurassic World-esque vibe, which could be appealing. In the end, my guess is that the timeslot will hold it back to some degree, but it'll still stand out among the surrounding repeats.